The name has been around for a number of years now. There have been many teeth whiteners that have promised you this and that, and produced average results. And some have quickly disappeared off store shelves. But Rembrandt Teeth Whitener has endured for one simple reason: It delivers a whiter and brighter smile. Period. 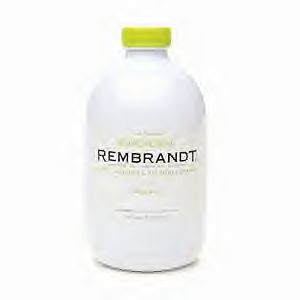 And Rembrandt has three powerful yet gentle-to-your-mouth products to maintain that beautiful smile. Let's be honest here---your smile says plenty about your physical attractiveness. You don't need big, chicklet-sized veneers to be pretty. Look at Julia Roberts. Her mega-watt smile has opened many doors in Hollywood. And her smile is real, and her teeth are white. Nothing fake or phoney. 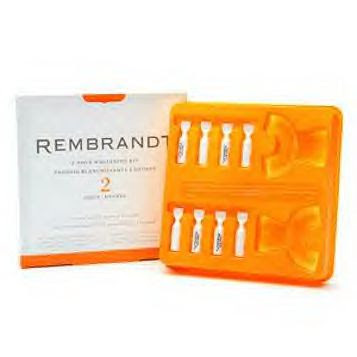 Rembrandt 2-hour Whitening Kit ($20.25. Save $5. Visit: http://www.rembrandt.com/). You need molding trays and whitening gel to get the brightest smile around. The kit includes it all. Simply mold the trays to your mouth. Apply the Rembrandt whitening gel to the upper and lower comfy tray applicators. Wear them for 20 minutes. Remove the trays for 10 minutes. And repeat for 4 applications and a total of 2 hrs. You end up with a visibly, gorgeous new smile. No more waiting months or weeks. One day in just 2 hours! The only company that can make that claim is Rembrandt. 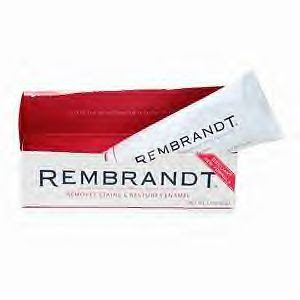 Rembrandt Whitening Rinse with Fluoride ($5.99, 16 fl. oz.) Fresh mint flavor. The only rinse out there that "whitens teeth while actively restoring tooth enamel." Use it every day to protect your teeth and make them stronger. Rembrandt Intense Stain Toothpaste with Fluoride ($7.49, 3 oz.) The third teeth whitening product in their line. An amazing toothpaste that "prevents plaque build-up, tartar, and gumline erosion." Clinically shown to lift those stubborn coffee and red wine stains. It, too, restores tooth enamel with special micro-polishing particles. Users remark that the toothpaste leaves your mouth very clean, just like a trip to the dentist. As the folks at Rembrandt say: "Take care of your mouth. It can be brilliant." Not as great as a professional whitening, but I have to admit, Rembrandt is very good for at-home whitening. I think using all three of their porducts workd well. I'm a heavy coffee drinker too.